Monday: Nothing a good ol' knees up can't fix! Little Victor has been called the King of Grit and the antithesis of meaningless virtuosity. HIs rich, quirky and inspired downhome blues became well-known to blues audiences throughout his work. 2 for £12 cocktails all day, and all night! Who says Cocktails are just for weekends? - Not us! 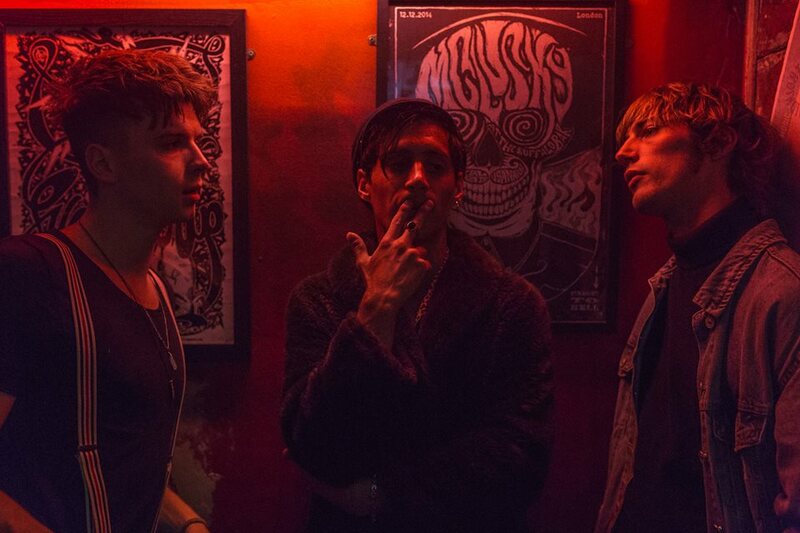 DAY TRIPPERS are back with a seamless LIVE set of Bluesy Rock n Roll right the way through to your favourite modern-day guilty pleasures... The energy these guys bring to the stage gets the dance floor jam-packed every time! You won't find a livelier venue than ours on a Wednesday.. The Black Lion presents... 'HIT THE DECKS' - Our VINYL-ONLY night every Thursday! Henry WP plays us his vinyl selections from Rock, to Funk & Soul, to Psych, to Golden-Age Hip Hop and back! PLUS... DRINKS DEALS UNTIL MIDNIGHT! BAM! Our girl Molly has been owning the Black Lion decks for years now..she knows how to get you dancing! DJ Eddie The Goatboy will be playing a huge variety of hits spanning the decades... This guy is guaranteed to inspire some serious shape-cutting on the dancefloor! Let Tulka Trio wash away the weekends' sins and soothe those Sunday-heads tonight from 9PM.. Expect all the biggest Neo-soul, Hip hop, Jazz & RnB tunes from the last few decades, played with the highest levels of musicianship. Brighton based Big Push are renowned for their smooth harmonies over upbeat rhythms!! Check them out on youtube and enjoy them LIVE and Free at Black Lion from 9pm! Black Lion Live present Dirty Weekend!! A live Festival themed band playing all your favourite 80’s & 90’s festival hits to throw dirty shapes to! Music kicks off at 9pm!! The Usual Suspects for Live Music Wednesday!! THE USUAL SUSPECTS are an awesome local 5-piece band who blow the funkin’ roof off once a month at Black Lion! Music kicks of at 9pm! Expect to dance away any hump day blues..
Open mic cypher with the full Chicken Grease Live band and improvised beats. It's going to go OFF! Brighton based record label QM Records host a night at The Black Lion. Thurs 18th March / 8.00pm / Free Entry. Amber Burgoyne is a Jazz/Folk singer-songwriter. Combining smooth acoustic guitar, storytelling lyrics, and a voice "that melts your heart". A sound heavily inspired by some of the great female voices; Billie Holiday, Nina Simone, Etta James and Amy Winehouse. Tammie is an 18 year old artist rising from the Seaside City of Brighton in the UK. Her first collaborative single “Best You Ever Had” with Changing Currents, shows her unique R&B-Soul vocals infused with elements of Hip Hop. Brighton based artist with a real bright future. 2 cocktails for £12, all day and all night! 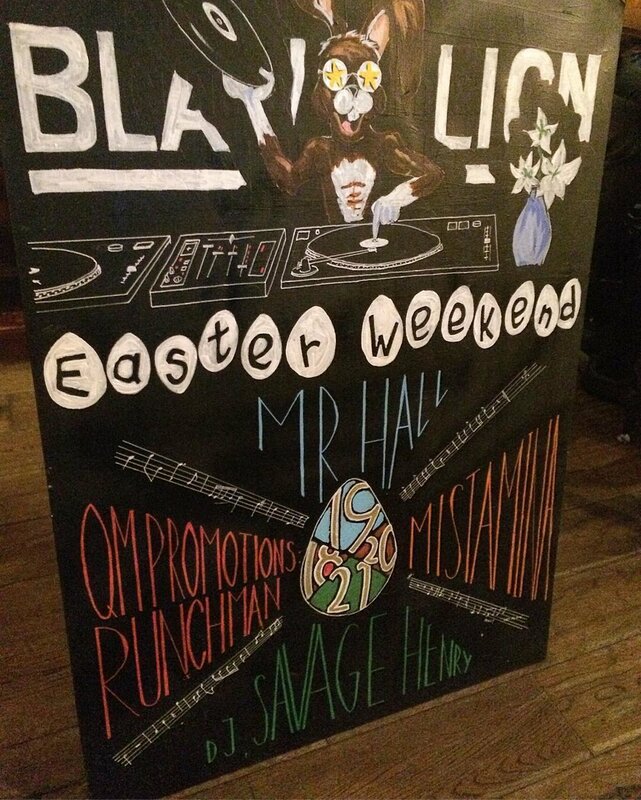 Black Lions Epic Easter Weekend continues tonight with DJ SAVAGE HENRY!! EASTER WEEKEND AT BLACK LION continues with DJ MISTA MINA!! Cirque du Sol's DJ MISTAMINA will be spinning a perfect soul-ection of hip hop, disco, and old-school jams. MISTA MINA is guaranteed to play an all night mix of dance-floor fillers! 9PM - 3AM for Black Lions epic Easter Weekend!! Start your Easter Bank Holiday right with us..
Open 12pm - 3am all weekend long!! With banging live music acts and DJ’s to keep you dancing from Thursday through Monday! Kick start your celebrations with Brighton based record label QM Records! Greg Miller (vocals, harmonica) and Tom Julian Jones (vocals, guitar) is an exciting up and coming Blues duo from London. Live tonight at Black Lion from 9pm!! New to the Black Lion ! MC CASHBACK will be giving you those Friday feels with a set jam-packed full of PARTY BANGERS from 9:30pm 'til 3am! Hip Hop, Breaks, Soul and Funk ! For 25 years this roots and blues outfit has performed at venues and blues festivals in both Europe and the UK, including sharing the bill with BookerT and the MG's, Nina Simone, Peter Green, Taj Mahal at the UK's legendary Bishopstock Blues Festival. The trio continue to bring their unique brand of american roots music to lovers of the blues everywhere! Expect an eclectic mix of old and new soul, from Michael Jackson and Anita Baker to Hiatus Coyote Steely Dan and Bruno Mars..... with plenty of vibe and unforgettable groove this band is one to watch!! PLUS INDUSTRY DISCOUNTS ALL NIGHT for our Hospitality comrades! A bit of mid-week live music for you lot.. with one of the best resident bands in the south, funk 'n roll the shizzle out of you!